On Sept. 28 Patrick Eric Duncan was finally admitted to the Texas Health Presbyterian Hospital in Dallas where he was diagnosed with the Ebola Virus Disease (EVD). He had visited the same facility just two days before complaining of symptoms associated with the disease but was not admitted but given antibiotics and sent home. This diagnosis of the first case of Ebola which impacted a Liberian national who had recently visited the West African state where the outbreak has had a profound impact, resulted in the focusing of attention by the corporate media to the United States in relationship to the crisis. Several people returning from West Africa have been pulled off airplanes and given special screenings by representatives of the Centers for Disease Control and Prevention (CDC). None so far who have been examined after exiting planes were determined to have EVD. A U.S. photojournalist, Ashoka Mukpo, has been transported to a hospital in Nebraska where two other patients who had also been in West Africa were successfully treated. The journalist had been working in Nigeria which has had very few cases and only the possibility eight deaths from EVD. In the Dallas area press reports indicate that over 100 people have been monitored and examined who may have had contact with Patrick Eric Duncan who as of Oct. 6 was reported to be fighting for his life in a critical condition. Children who may have had contact with Duncan have been taken out of school and at least one homeless man is also being monitored by health officials in Texas. Duncan’s health status deteriorated during the first weekend of Oct. Perhaps the delay in admitting him to a hospital may be a factor in his worsening condition. 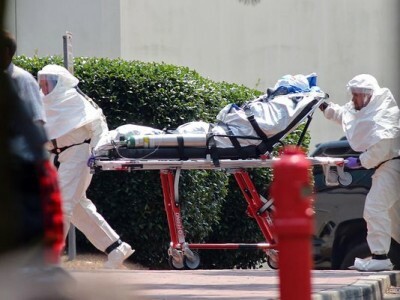 Within the top echelons of the infectious disease diagnosis and treatment hierarchy in the U.S. it has been admitted that there is no specific medical protocol for the screening and treatment of Ebola patients. MZapp, the vaccine that has been tested on at least two U.S. patients evacuated from West Africa, is still not approved for general usage even if it was available for broader distribution. Nonetheless, the spread of EVD is continuing in the most affected states of Liberia, Sierra Leone and Guinea. The threat of contracting the disease in the U.S. has been described as almost nil by leading healthcare professionals. The CDC provided statistics on the number of cases and deaths from EVD as of Oct. 3. There numbers say that 7,470 possible cases have occurred while the death toll had reached 3,431. Even though there has only been one case documented in the U.S. involving someone who had traveled to the affected region and may have assisted a woman exhibiting symptoms prior to returning to Texas, the focus of the disease has shifted to Patrick Eric Duncan in Dallas. The apartment where Duncan stayed prior to being hospitalized was not investigated by health officials until Oct. 4. Reports said that the residents of the apartment were not being allowed to leave. This level of panic has generated concerns in the African immigrant community in Dallas of a possible racist stigmatization. African immigrants who live in the Dallas area told Reuters news agency that they are experiencing fewer handshakes and more suspicious stares. One resident said that someone told him to go into quarantine. A public meeting on the political aspects of the EVD outbreak in West Africa was held on Oct. 3 sponsored by Workers World Party in New York City. It was important for the organization to place the current crisis within a political and historical context. Noting that since the disease is at present affecting regions of Africa where there have been significant levels of immigration into the U.S., it was necessary to demonstrate solidarity with these communities in the New York area and around the country. Workers World newspaper has published several articles on the outbreak and the need to view the crisis within the context of the legacy of imperialism in Africa. The European slave trade and colonialism did not target Africa to foster its development but to seize control of the labor power and resources of the continent. The lack of proper healthcare infrastructures in the impacted states is clearly related to the spread of EVD as well as other preventable and curable diseases such as malaria, polio, measles and meningitis which annually kills far more people than Ebola. Therefore in the medium and long-term there must be the advocacy of genuine development in West Africa and throughout the continent. Imperialism being the source of this underdevelopment must be eradicated in order for the people of Africa to claim their rightful place in world affairs.